Scottish lawmakers have been told they should change the rules surrounding divorce to stop harming the future of children affected by their parent’s separation. The call follows a move to change the law in England and Wales by the British government to allow divorces without apportioning blame. This goes beyond the current situation in Scotland where couples looking to split will still have to blame one person if they wish to divorce before a year of separation. However, the Scottish government confirmed they are not planning on changing divorce law in the country in order to match the proposed changes in England. Amanda Masson, partner and family law expert at the law firm Harper Macleod said the current rules in Scotland can cause resentment between parents who split, negatively affecting their children. She said: “The law should change, primarily because it would take away the attachment of blame from a separation situation. 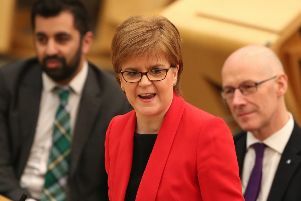 She added that while the system in Scotland is broadly the same, the law will fall behind England and Wales once the proposed changes come into place. Ms Masson said: “We do still have this fairly draconian idea that it must have been somebody’s fault. “I hope things will change and if we can move away from this idea it will make separation easier for children as well because the acrimony must be devastating for them. UK Justice Secretary David Gauke announced the proposed changes on Tuesday, 9 April, following a consultation last year. If passed by parliament it will allow couples in England and Wales to merely state the marriage has irretrievably broken down, rather than proving it through unreasonable behaviour or adultery. A spokesman for the Scottish Government said there are no plans to change the divorce laws in Scotland. They said: "There are a range of factors that can demonstrate there’s an irretrievable breakdown of marriage, including if both parties agree to the divorce and they have lived separate lives for at least one year or, if one party does not agree to the divorce, they have lived separate lives for two years.